Our luxury condos are two bedroom, two bath, privately owned condos in the city's best resort. One, two and three beds. 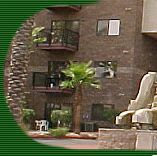 Fully equipped with TV, VCR, Microwaves, Coffee Makers, Washer & Dryers, Dishwashers, Phones, Linens (Just bring your clothes). Fabulous lake & mountain views, just steps from the London Bridge & lake. All Units feature covered parking spaces, allowing pull-thru boat and car storage and RV parking. Gated Community. Heated Pool, Two Spas and BBQ Gas grills are available at the Pool area for your use. Lovely recreational lobby for cards, ping pong, TV, etc. All Condos are nonsmoking and do not allow pets. 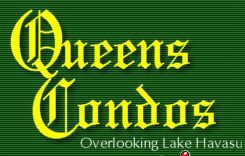 Queens Bay Resort Penthouse Floor Condo: The most spectacular view the city has to offer of the lake, london bridge, channel walk, english village, mountains, golf course.